If you have ever wondered how Political Correctness got such a tight grip on modern Britain, then look no further than this hilarious and deeply subversive book. This is the follow-up book to the outstandingly successful “Politically Incorrect Lexicon” by author Peter Mullen. The Prophet of Political Correctness - Bossy of Islington - is born in a garden shed on a council estate, but he is inspired to go far beyond his humble origins. Going forth to proclaim the creed of Political Correctness to modern Britain, Bossy gathers around himself 12 groupies who aid him in spreading the message. Along the way they meet representatives of modern Britain, engage in humorous adventures and prove themselves to be the most hapless bunch of accident prone prophets that ever walked the Earth - but they always work tirelessly with single minded zeal to transform Britain. 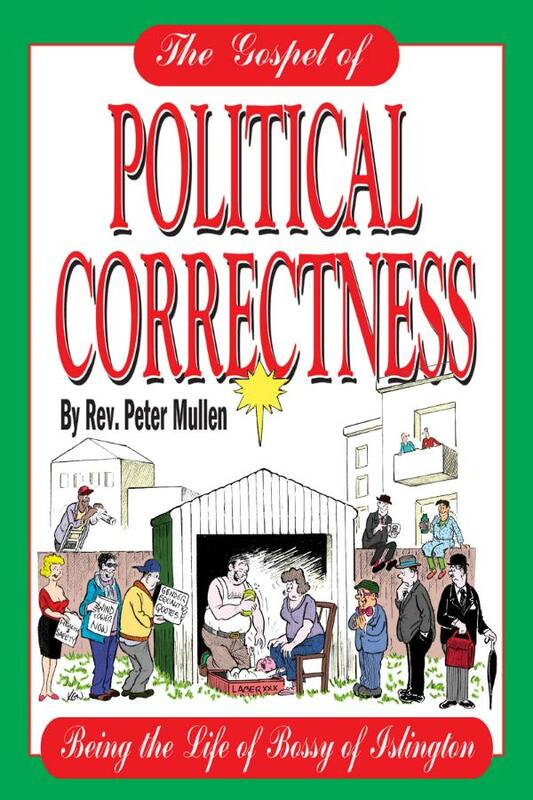 Through the hilarious career of Bossy of Islington, author Peter Mullen analysis the Political Correctness movement, explains how it works, mocks it for the charade it is, sets out why it has become so powerful and says what he thinks should be done about it. Couched in familiar Biblical style to mimic the Gospels of Christianity, the Gospel of Political Correctness works on a number of different levels - witty, slapstick, intellectual and political. And it is guaranteed to raise a storm of controversy with its subversive underlying message. The Reverend Peter Mullen is religious columnist for the Daily Mail, a frequent blogger for the Daily Telegraph and several regional newspapers. He has recently retired as Rector of St Michael's Cornhill - one of Sir Christopher Wren's churches in the City of London. He is also Chaplain to the Stock Exchange and Chaplain to the Guild of Air Pilots. Peter writes a regular column in the Wall Street Journal. Ken Wilkins has recently retired from the Beano.